Bryanna Bradley is one of the leading female surf photographers in Canada. Her clients include Roxy, Sanuk, Finesterre, Core Surf, MEC, Herewith Magazine, Surfline, SBC Surf, Pacific Longboarding Magazine, SurfGirl Magazine, Queen of the Peak, and Surf Sister in Tofino. Photography by Bryanna Bradley. A workshop tailored to photographers of all levels looking to expand their knowledge about shooting the endless beauty of both landscapes and people that are inspired by the ocean. Located in Tofino, where the coastline is decorated with west coast charm and the ocean surrounding the beautiful peninsula offers a diverse opportunity to bring new perspective and inspiring focus to your photography. Bryanna will focus on shooting natural light, adventurous scenery, composition techniques, weather challenges, unique perspectives, and a variety of endless photographic opportunities the ocean presents. 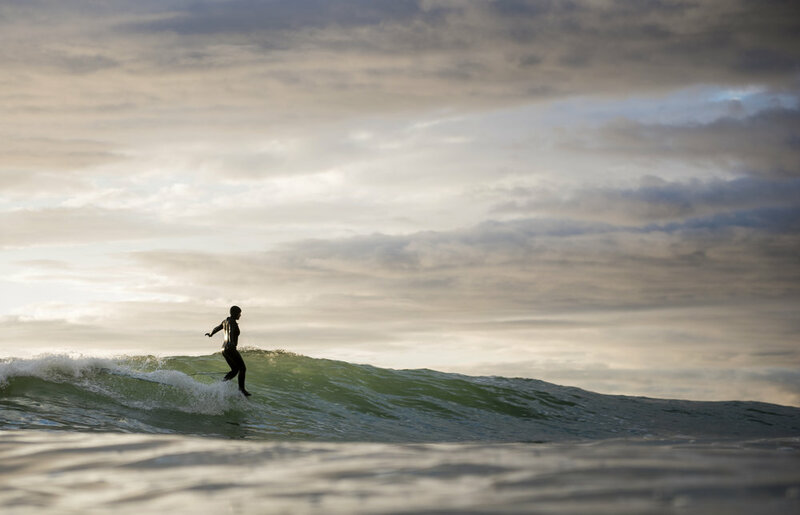 Bryanna captures the rugged beauty of Tofino’s waves and the determined female surfers who ride them. Come stay and relax at the newly built Noorish House, located near North Chesterman Beach, in Tofino. Your workshop includes 3-nights stay in a private or shared room, a welcome afternoon appies and drink on the first day upon arrival, healthy home made breakfast daily, and an afternoon appies and drinks on our last day together to share our images in an Expression Session in a supportive environment. Experience Required- Must have own gear & general understanding of manual mode. Arrivals and Introductions ~ 4pm - 5:30pm. Settle in, meet Bryanna and Liv and enjoy refreshments before heading out for dinner at your own leisure in town. Breakfast - 8am - 9am. Early risers are welcome to wander to one of our many nearby wonderful coffee shops or take in a morning beach walk. Morning - 9:30am - 11:30am - 2 hour introduction & foundational theory. 5pm - Expression Session over refreshments and small bites as we share in our images and lessons. The kaleidoscope of colours at sunrise and sunset in Tofino is nothing less than magical. Photo credit: Bryanna Bradley. Please review our Cancellation Policy below. Full details on Cancellation and Refund Procedure can be found in the Terms and Conditions. Retreat pricing includes all nights for accommodations, breakfasts daily, unlimited house teas and coffees, juices and milks, two refreshment and appetizer courses and photography workshop taught by Bryanna Bradley. My name in Bryanna Bradley, I am a professionally trained photojournalist turned surf and wedding photographer. As my photography has moved away from journalism and more towards weddings and surf I still hold documentary style photography close to my heart. I have a strong affinity towards natural lighting, beautiful giggles, and contrasting colours. My passion for documenting the raw beauty of emotions and dreamy visuals has not changed. My style of photography is based on people and the experience, including all the little moments. Cancellations received 185 days (or more) of departure will incur a penalty of 10% per person. Cancellations received within 154 days of departure will incur a penalty of 25% per person. Cancellations received within 123 days of departure will incur a penalty of 50% per person. Trips require a minimum number of participants to avoid cancellation. We reserve the right to cancel a schedule trip and fully refund affected customers although Noorish Tofino Retreats will make every effort to maintain the normal operation.